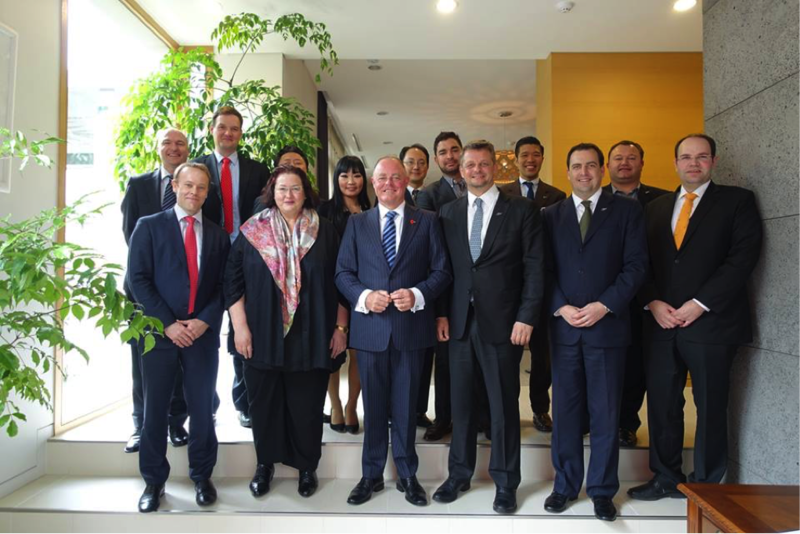 Pictured: New Zealand Ambassador to Korea Claire Fearnley (Front row 2nd from left) with New Zealand Government Minister Craig Foss (Front row 3rd from left) along with the Kiwi Chamber of Commerce Board of Directors and Advisors. Minster Craig Foss, responsible for both veterans’ affairs and small and medium businesses (SMEs), met with a group of Kiwi Chamber members over lunch at the New Zealand Ambassador’s residence in Seoul. Discussion focused on the issues and opportunities for Korean and New Zealand small businesses. It was agreed that New Zealand’s underlying brand reputation and bilateral FTA with Korea provide a solid foundation on which to expand the trading relationship and to increase businesses awareness of each other’s sophisticated consumer markets. From the World Markets Korea CEO desk: As a Kiwi Chamber Board Member in 2015 and now as a Special Advisor to the Board in 2016 I am passionate about the growth and development of the relationship between Korea and New Zealand business. It was an honour to attend the lunch. The conversation was enlightening and I left invigorated and re-energized. Special thanks to Ambassador Fearnley for hosting the lunch at your residence in Seoul and Minister Foss for your wise insights and allowing us to suggest issues we are facing on the ground on a day to day basis in Korea. It was also honourable of you to let us give constructive feedback frankly on how the New Zealand Government can support us in Korea and more importantly promote the Korean market to New Zealand SMEs so they will be able to make informed decisions on their own business growth and direction. With the recent FTA it is becoming easier to do business together and there are benefits to be aware of. Also as an SME owner in Korea I want to let all Kiwi SME’s know that there is an active New Zealand Chamber of Commerce in Korea and there are Kiwis here doing well in their SMEs. We are all open to support and facilitate your market entry to South Korea. This is a vibrant and viral market with a small geography home to 50 million people, so if you have a product or service that would do well here it is a viable option to at least try. It makes good business sense right now to do so whether using it as a growth tool or stepping stone to big brother Chinese market in the future or as a market choice for other reasons. South Korea is in the top 10 economies of the world and a great place to do business.